From the earliest days, there were schools in the tiny settlement that would become Rock Island, but they were private and usually quite small. Academic courses offered in the 1840s ranged from astronomy to ornamental sewing. Tuition was charged and educational standards were inconsistent. A free public school system was critical for community development. In 1857, a unified public school system for Rock Island was chartered. A few years earlier, five separate grammar school districts had been established, each with its own board and taxing authority. Each of the five was represented on a Union High School board. The first high school in Rock Island was built on the northwest corner of 7th Avenue and 22nd Street. It was a three-story brick building with multiple chimneys so each classroom could have its own stove heat. But before it was even occupied, it burned on July 4, 1858. After the debris was cleared, construction of a second high school at the same location was begun. Ready for occupancy in 1859, it served the community until it was replaced by the third high school, occupied in 1887, at the southeast corner of 6th Avenue and 21st Street. The second school was then razed in 1892 to make way for what became Old Lincoln School. The 1886 school, a near twin to Lincoln but with a round corner tower, was doubled in size by an 1898 addition. Once again, fire struck, and on February 15, 1901, the third high school burned to the ground. In 1902, the fourth high school opened on the same 6th Avenue site as the third. It was designed by architect Ferdinand F. Borgolte and built by contractor John Volk at a cost reported to be $115,000. In that same year, Volk was responsible for two other large projects, the Rock Island Lines depot and the Harms Hotel. 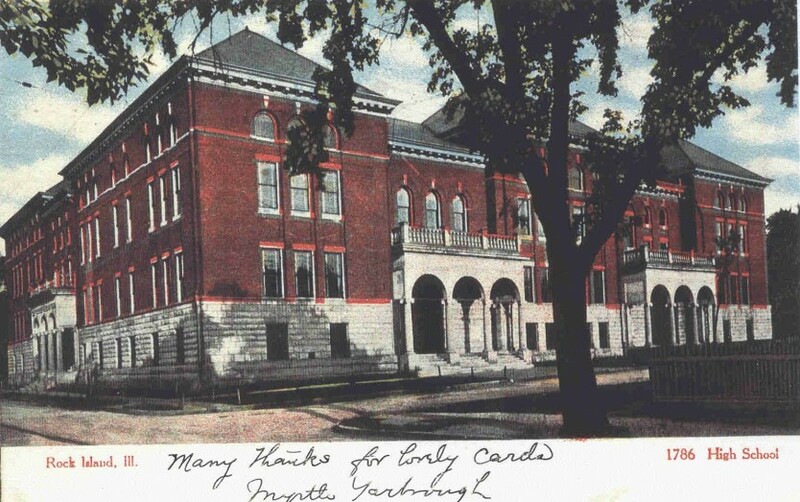 German-born and trained Borgolte also designed Hawthorne School and the Harms Hotel in Rock Island as well as Moline’s downtown Carnegie Library. This postcard shows the high school not long after it was built, when 21st Street was still open between 6th and 7th Avenues. The view is looking toward the southeast and shows the main entrance on the 6th Avenue side at the left, with two other porticoed doorways around the corner on the 21st Street side. The tall stone foundation with red brick above and the hipped roofs complemented the design of Lincoln School, which was catty-corner on the square school block. The new school formally opened on Friday, December 12, 1902. The public was invited to visit while classes were in session that day, then attend a program in the auditorium on the east side of the building. Termed one of the most efficiently designed schools in the state, it would be a source of pride and sentiment for the community for decades. Today some claim that there is too much pressure on students, but in 1902 it was a point of pride that Rock Island’s high school “operated pretty much on the high pressure plan and every effort is made to secure all from the pupil that he is capable of without doing injury to himself.” Even the many clubs had an academic emphasis, from literature and German to parliamentary law. There were competitive sports, too, including football, baseball, and basketball, the latter even including a girls team. Over the years, nearly 5000 students would receive their high school diploma here. In 1937, today’s hilltop high school opened, and the postcard building became Central Junior High School. For the third time the curse struck. On Sunday, December 11, 1949, two 14-year-old girls went to a grocery store across 6th Avenue at 7 pm to report a fire. Despite quick fire department response, less than three minutes later the fire engulfed the school. Nearby homes and trees to the north and east were endangered by fiery debris that was pushed by 50 mph winds. A crowd estimated at 20,000 crowded the streets watching the flames that were reportedly seen 15 miles away near Preemption. Although control was established by 8:40 pm, the building continued to burn until the next morning. The unsupported walls were quickly knocked down before they could fall uncontrollably. At the time of the fire, Central had nearly 700 7th and 8th grade students attending. Franklin School on 9th Street had temporarily closed for construction of a large addition and those students were attending Central. Later it was determined that the two girls, Central students, who reported the fire had actually set it. Plans were immediately made to rebuild. Architect Rudolph C. Sandberg was hired to design the building that was completed in 1953, partially extending to the now-closed 21st Street. After Central Junior High closed, that building became the new “Lincoln School” and later the Intermediate Academy. Since a new school was built on the site of the former Villa de Chantal, the old Central building is vacant. But the old postcard high school remains a vivid memory for many Rock Islanders. This article, by Diane Oestreich, is slightly modified from the original, which appeared in the Rock Island Argus and Moline Dispatch on February 4, 2007.